Bringing the Tamagotchi universe to life in full 3D for the very first time, Tamagotchi Party On! is fantastic pick-up-and-play multiplayer party fun. The unique Wii control system lets players swing, shake, point, turn and twist the Wii Remote to play their way through the quirky gameworld, which turns the whole Tamagotchi Planet into a giant 3D board game filled with unique towns and other fun locations to explore. 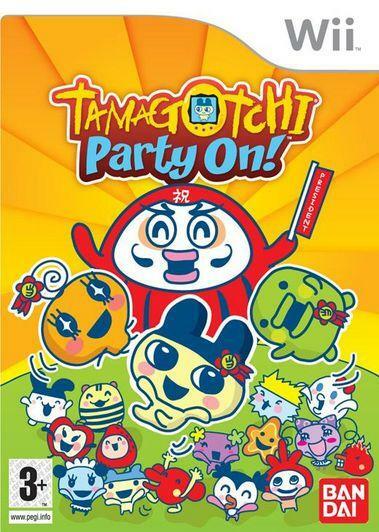 Gameplay is instantly accessible and perfectly suited to Wii, with a host of exciting mini-games that will test the playerâ€™s skill either solo or against up to three friends to see who has what it takes to become Tamagotchi President. Players can choose to play as their favorite Tamagotchi character and level them up through the game. With Gotchi earned along the way, players can customize and decorate their campaign headquarters however they like, allowing them in turn to give their characters a fresh new look and increase their chances in the Tamagotchi popularity stakes.